The 1934 World Series matched the St. Louis Cardinals against the Detroit Tigers, with the Cardinals' "Gashouse Gang" winning in seven games for their third championship in nine years. The Cards and Tigers split the first two games in Detroit, and Detroit took two of the next three in St. Louis. St. Louis proceeded to win the next two, including an 11–0 embarrassment of the Tigers in Detroit to win the Series. The stars for the Cards were Joe Medwick, who had a .379 batting average with one of St. Louis' two home runs and a series-high five RBI, and the Dean Brothers, Dizzy and Paul, who combined for all four of the teams wins with 28 strikeouts and a minuscule 1.43 earned run average. 1934's World Series was the last of which both teams were led by player-managers. 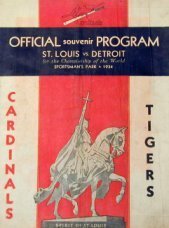 The Cardinals and Tigers have met twice in the World Series since 1934; in 1968 (won by the Tigers in seven games) and 2006 (won by the Cardinals in five games). Tigers pitcher Denny McLain, who won one of the games in the 1968 Series, had won 31 games during the season, outdoing Dizzy Dean. Dizzy, age 57 in 1968, posed for a picture with McLain. The Cardinals used eight (8) pitchers with a team earned-run average of 2.34 for the Series. But only two earned victories; brothers Dizzy Dean with two (2) wins and Paul Dean with the other two (2) wins. Pete Fox played for the losing team yet became the only World Series player to hit six (6) doubles in any Series of any length. Dizzy Dean nearly took himself out of the Series on a play in Game 4. In the fourth inning, he pinch-ran and literally broke up a double play attempt by taking the relay through in the noggin. The unconscious Dean was rushed to a hospital for observation. He was given a clean bill of health. Legend has it that at least one newspaper the next day featured the headline, "X-ray of Dean's head shows nothing." Dean had recovered from this trauma sufficiently to make his next starting assignment, the very next day. According to The Fireside Book of Baseball by Charles Einstein, in the seventh game Frisch called time and walked over from second base to the mound to tell Dean "If you don't stop clowning around, I'll take you out of the game." Dizzy said, "No you won't." Frisch thought about this a moment. Then he returned to second base. Once again, the St. Louis Cardinals returned to the big show after edging out the defending champion New York Giants (in the final 3 1/2 weeks of the season) and winning the National League pennant by two games. Solid pitching had enabled them to hustle their way into the post-season thanks in a big way to Dizzy Dean, who had won an amazing thirty games for the senior circuit champions. Dean was a dynamic and outspoken player who was quoted in the press as stating "it-ain't-bragging-if-you-can-do-it". Dean wasn't the only standout as Manager Frankie Frisch had assembled a line-up of mutli-talented players that would come to be known as "The Gas House Gang". Many felt that their "all-out" style of play was a decided advantage over the American League's Detroit Tigers, who were 0-3 to date in World Series appearances. Dizzy Dean took the mound in Game 1 and was backed up by a solid performance at the plate by Joe Medwick who collected four hits including a home run. Detroit made their own contributions as well by tallying five errors in the first three innings in an 8-3 opening loss to the Redbirds. The Tigers struck back the following day with an outstanding outing by Schoolboy Rowe, who held the Cards to a single hit in the twelve-inning, 3-2 victory. Rowe had won sixteen consecutive games from June to August and showed no signs of slowing down as he dominated the St. Louis line-up. Apparently, the Cards weren't they only team with tenacity and resolve. Game 3 tipped the scales again as Pepper Martin, the center fielder-turned-third baseman who had boasted a staggering .500 batting average during the '31 Series, shined with a double, triple and two scored runs. Dizzy's brother Paul (who had thrown a no-hitter against Brooklyn late in the season) shut out the Tigers for 8 2/3 innings for a 4-1 triumph and the Series lead. Detroit battled back with two crucial 10-4 and 3-1 victories that featured Billy Rogell and Hank Greenberg combining for seven runs batted in, with Eldon Auker and Tommy Bridges both going the distance. Schoolboy Rowe returned for a repeat appearance (and possible clincher) in Game 6 against Paul Dean who was coming off of a great debut outing in Game 3. The St. Louis rookie prevailed over the second-year man on both sides of the plate as he held the Tigers to seven hits and, with the score 3-3 in the seventh inning, delivered a game-winning single. As both teams had battled back and forth throughout the contest, tensions ran high in "The Motor City". The atmosphere around Game 7 was electric as Dizzy Dean went up against Eldon Auker for the grand finale. St. Louis came out swinging with seven runs by the third inning and a 9-0 lead in the sixth. Detroit's fans were visibly upset (with the score) and a play involving a hard slide by Joe Medwick that momentarily injured third baseman Marv Owen. They erupted after he apparently made eye contact with the left-field bleachers and retaliated by throwing empty bottles, fruit and other debris. In an effort to avoid a possible riot, Commissioner Kenesaw Mountain Landis stepped in and removed Medwick from the game (who was replaced by Chick Fullis). Understandably, the Cardinals argued the call, but the controversial decision had little impact on the outcome as St. Louis went on to an 11-0 victory and another World Series title. The unpopular Medwick batted .379 against Detroit and drove in five runs, while Collins hit .367 and Martin finished at .355. Ernie Orsatti contributed a .318 mark, and Jack Rothrock led St. Louis with six RBIs. Charlie Gehringer led Detroit with a .379 average and Greenberg hit .321 with a Series leading seven runs batted in. Despite quality hitting on both sides, pitching was the deciding factor in the 1934 Series. Dizzy and Paul Dean were standouts after winning forty-nine games in the regular season and both had combined for all four St. Louis victories in the 1934 Series.